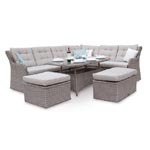 When choosing Garden Furniture or any form of Outdoor or Patio Furniture it is very important to choose the right set from the onset. 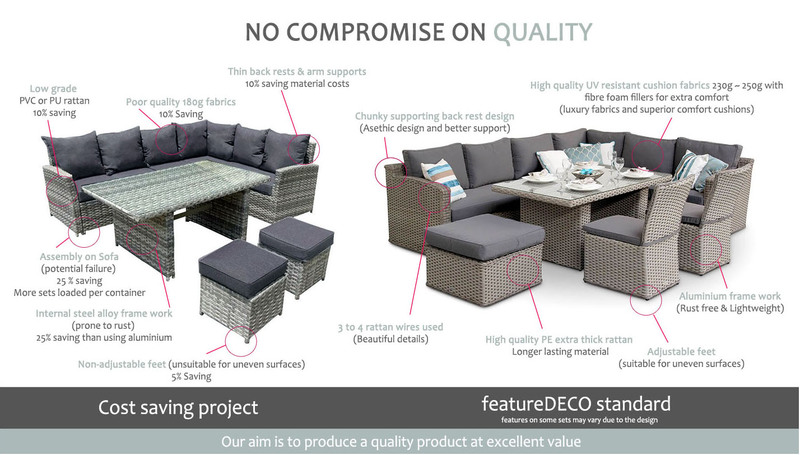 Here at featureDECO we aim to not only advise you of the right choice of Garden Furniture but also make sure the Outdoor Furniture you choose is right for you. 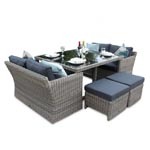 Why Choose featureDECO Rattan Garden Furniture? 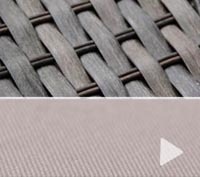 Highly Durable all weather UV stabilised 100% PE RATTAN - The best outdoor synthetic material and the recommended grade for hot and cold climates. 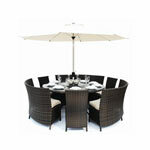 PE rattan is ECO-FRIENDLY as it is fully recyclable, unlike PVC and PU. 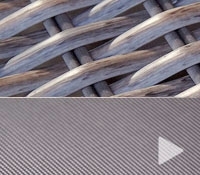 THICK RATTAN FIBRES. 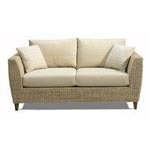 We only utilise high quality thick rattan fibres for our furniture which is almost 3-5 times the weight of low grade rattan. 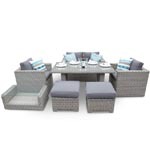 Our products a made with a combination of a variety of rattan fibres such as 6mm half moon round, 12mm extra wide flat, 20mm extra wide flat and 10mm half moon round chunky rattan. 5mm Round weave for trim details. 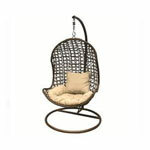 HAND WOVEN & TEXTURED rattan with a variety of different colour tones to give an authentic feel. 100% ALUMINIUM FRAME which means no rust on the frame unlike a frame made of steel. Steel framed furniture may rust after a year if it is not maintained and cleaned regularly. Also, steel frame furniture is up to 30% cheaper than aluminium furniture due to the higher cost of alumninium material. NO ASSEMBLY required on sofas or chairs along the sections of the furniture. This gives a more aesthetic pleasing finish and welded frames have studier construction which is very important for sofas. Our tables require light assembly. 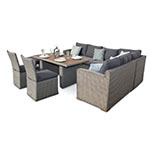 Most of our furniture is equipped with ADJUSTABLE FEET on sofa sets and chairs which is ideal for uneven patio surfaces. The SHOWERPROOF 230~250g SPUN POLYESTER PIPED CUSHIONS have a more luxurious feel and good durability compared to lower grades of fabric. The cushions either have a mix colour weave or a ribbed pattern on the fabric. 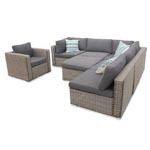 Try to avoid low grade cushions which use lower quality 180g polyester as these will wear quicker. Our EXTRA COMFORT CUSHIONS use a foam and filler mix. The foam is sandwiched between the filler material which provides extra comfort. If pure foam is used, the cushions tend to be either very hard or very soft depending on the density of foam. 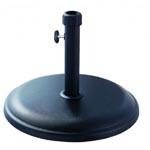 DESIGNED IN THE UK and manufactured with high quality standards. 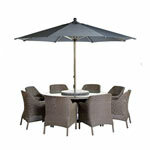 featureDECO have been supplying outdoor furniture for over 10 years. 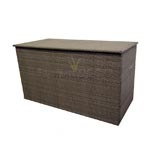 Our ranges are supplied all over the world from the manufacturing base in Vietnam. We import, warehouse and deliver DIRECT to you. No garden centres, wholesalers or middlemen. 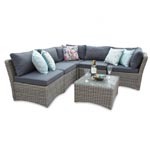 For example the set above called the 7 Peice Manchester Corner Sofa Set will be price around £1249 in a garden centre, £825 at trade (featureDECO price) or £500 in low quality on Ebay. We do not believe in cutting costs to compromise on quality as we believe in supplying an excellent standard that looks the part and is long lasting. 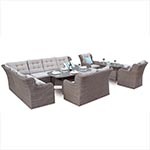 It is possible to save upto 60% by changing features such as the framework material (from aluminium to steel), rattan material (PE to PU or PVC), construction (Seamless to Seamed flat pack), design features (thinner arms, backs, open sections), cushion quality (from 250g to 180g), etc. At featureDECO we pride ourselves in the quality that we provide. 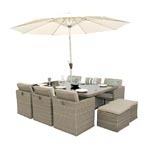 Here is a summary explaining the details of the rattan garden furniture. Self Assembly Sets are not as sturdy as fully assembled set nor aesthetically pleasing. 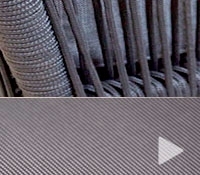 The type of synthetic fibre is an indicator for quality of polymer used. Low-value cushion fillings are an easy way of detecting a low-value product. 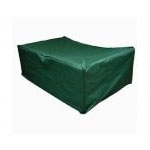 We offer a range of covers; what’s important is the weight, which affects the feel of the fabric. 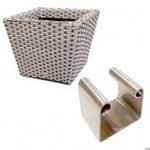 What are the Plastics used for Rattan Garden Furniture? 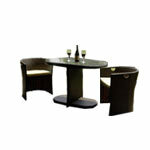 The main three plastics used for outdoor furniture are PE, PU and PVC. They are all 100% waterproof, resistance to mould, sun exposure and extreme temperatures, however each material varies in properties that provide the best life expectancy for outdoor use. 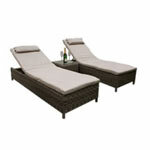 PE rattan furniture is used for many outdoor rattan products. PE(Polyethylene) is a thermoplastic resin, which means an item made with the material can be recycled, melted down and reformed into another shape. This means PE furniture is ECO-Friendly as it is fully recyclable. PE is also a tougher material than PU & PVC. A hard wearing, durable plastic with excellent UV and mould resistant properties. It is still suitable for the British weather, however we recommend covering the furniture during the winter months for added protection. PU features good elastic strength and will provide good resistance to cracking. For frequent usage of furniture, PUs flexibility properties provide good life. 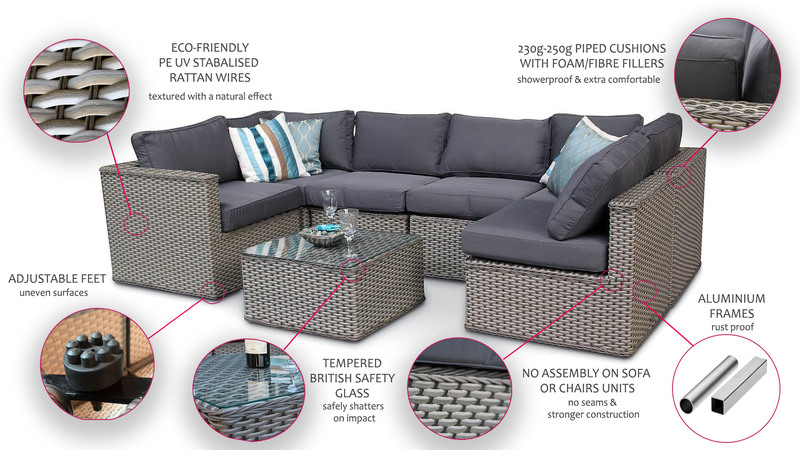 Also features good UV and mould resistant properties, however the downside to PU is that is not recyclable and not as durable as PE rattan. It is still suitable for the British weather, however we recommend covering the furniture during the winter months for added protection. 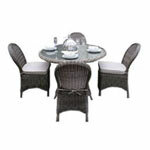 PVC rattan furniture is another material used for outdoor rattan. 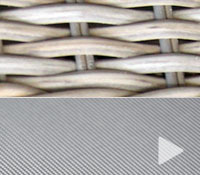 PVC is mixed with an elastic material to add flexibility and then woven onto a metal frame. 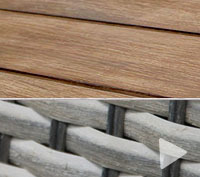 Its properties on rattan furniture are lower than PE and PU. It is suitable for the British weather, however we recommend covering the furniture during the winter months for added protection. Commercial grade plastics, Branded plastics such as, Hularo, Viro, Rehau are essentially PE and offer great elasticity and durability. They provide excellent resistance against mould, sun exposure, heavy weather conditions and extreme temperatures. 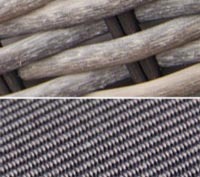 The rattan fibres are highly engineered to provide great detail in the weave and therefore the weave process is sometimes more complex. Generally, these plastics are branded and therefore carry premium raw material prices which also reflect the price of the end product. PE, PU and PVC are suitable for UK weather conditions; however the Best choice for the UK is PE which is eco-friendly, features good flexibility and strength. PU is suitable however it is not as durable, nor is it eco-friendly. 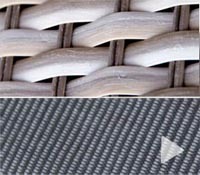 PVC is the most cost-effective material for rattan, however this will deterioate very quickly. 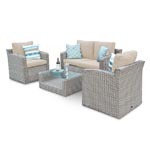 Why does the price vary for the rattan furniture? It is all to do with the volume of stock we bring in and the special deals we provide to our customers. 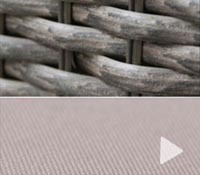 We have been supplying Rattan Garden furniture for over 10 years since it entered the UK market so we have experience across a broad range of quality. We pride ourselves on good value, well designed products specifically tailored for the UK market. 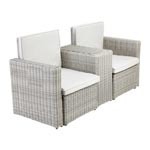 Other names for Rattan Garden Furniture? 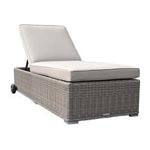 Rattan Garden Furniture, Wicker Garden Furniture, All weather garden furniture, polyrattan, polyresin, resin weave, plastic garden furniture. 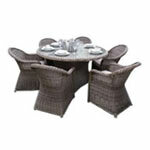 It is all the same thing, Rattan Garden Furniture”. Cushions made of spun- polyester fabric are suitable for outdoor use. 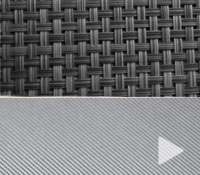 Typically the material is stitched over quality HD foam or some other type of material. You need to invest in cushions that will last longer, so make sure you pay attention to the characteristics of the materials that are employed in making them. It is best to avoid purchasing cheaper cushion fabric as the quality will not be as good. 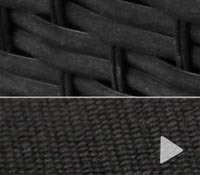 What is Textweave or Textilene? 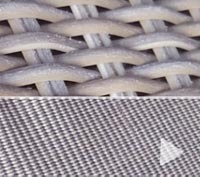 Textweave, Textilene or woven PVC coated polyester fabric is a very durable fabric and is available in a variety of designs and styles. We use high end woven fabrics that have intricate patterns and a variety of colours to provide a stylish finish. Please do not confuse this with 1x1 mesh textilene on low end sets. 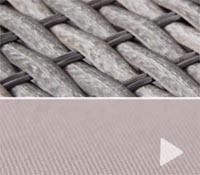 Textweave is both strong and attractive as it is made of woven polyester non-stretch yarn which is flame retardant, heat sealable and mildew resistant. Formulated from yarns developed to withstand wear and tear for many years of outdoor use it is ideal in both hot and cold temperatures. With little maintenance required, the colours remain crisp and vibrant after years of continuous outdoor exposure. Typical life expectancy is 5-10 years. What are the Metal Components used in Garden Furniture? Many of our ranges are constructed of steel or aluminium. Our steel products undergo many cleaning, rust inhibiting and powder coating processes so that the product can withstand the outdoor environment, however those living in coastal regions will be aware that sea spray and salt air play havoc with most metals, especially steel. Although our furniture is weather and rust resistant, we offer no guarantee against corrosion by sea air. If you live near the sea, you would be better advised to consider one of our aluminium based ranges for the base material, with has excellent corrosion resistant properties as it forms a protective layer when exposed . Coatings and accumulation of dirt on the intermediate coating can cause a reduced durability. Very often this is a consequence of long-term moisture. Dirty surfaces should be cleaned once or twice a year depending on the grade of contamination. What is Cast Aluminium Garden Furniture? Cast Aluminium garden furniture is a great choice for any garden and is a popular choice in the UK market as its classic style is well suited to many homes. Cast Aluminium furniture is manufactured to a high standard and has a superb powder coated finish applied. The base material is aluminium which is high rust resistant and the powder coatings applied are specified specifically for outdoor use. 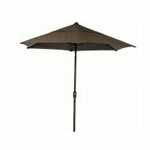 It is designed to be left outside all year round and considerably lighter than wrought iron and cast iron furniture. What is Acacia Wood Garden Furniture? We prefer to retail Acacia timber as it has a nice golden colour and is a strong hardwood perfect for garden furniture. Other hardwoods are orange or dark brown and do not look aesthetically pleasing. Royalcraft use FSC acacia with a golden colour resulting from oil treatments during manufacturing. If left untreated this colour will mellow to a silver grey finish over its lifespan. To bring the colour back to its original finish simply sand it down at the start of the season. Please note, this guide is only an indication, however in the really environment, factors such as high usage, under commercial applications, general maintenance can affect the life. We also recommend the use of a cover as this ensure the furniture does not get detriote and keeps it free from dirt residue.